I Don't Blame You is the story of losing a mother a mere two months before becoming a mother. It follows Ana through a year of going between her home in Portland and her mother's home base in New Jersey as her mother battled cancer and as Ana grew a baby. The narrative begins with backstory around her mother's early life being raised by a single mother in a Bronx tenement apartment and also her father's early years in depression-era Brooklyn both parents raised in challenging circumstances by Italian immigrants. It takes the reader through her parents’ bitter divorce after raising three children and after twenty-five years of marriage, which left Ana’s mother, who was mentally unwell and unstable, to raise her alone. "Frances Badalamenti proves to be a talented and evocative writer. 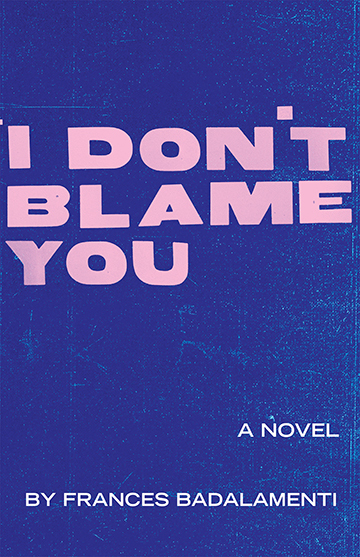 I Don't Blame You is a powerful, heady, debut novel, gorgeously interweaving the story of grief, acceptance, and love. A must read."